As we approach the end of the winter season we see wind production fall this week to 1.28GW (on average throughout the week), half the output generated the previous week. Day Ahead power ended up with an average of €49.43/MWh (increasing by 22% from week 11). The spread returned to levels seen in previous weeks with a high of €85.00/Mwh and a low of -€1.00/MWh. NIV positive (short) for 169 times and negative (long) for 167 times. 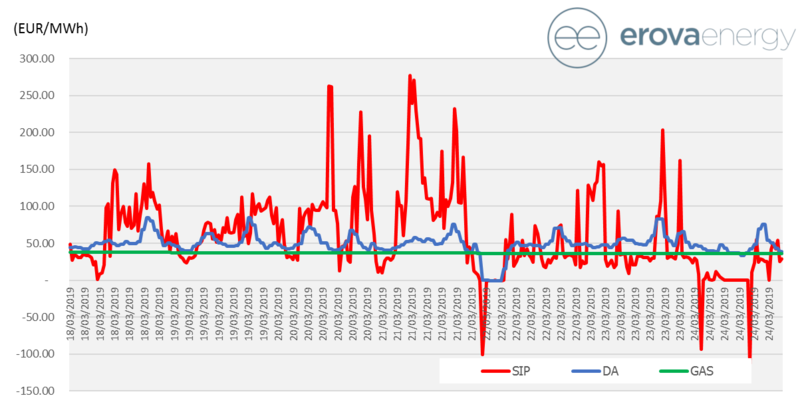 System prices (SIP) was up considerably delivering an average price of €60.93/MWh (double that of last week). LNG prices in East Asia are now below NBP placing continued pressure on NBP, falling a further 5% at 36.89p (Max 37.80p and Min 36.30p).